Our design agency partner came to us for help executing a high-profile environmental branding project for their client, a global technology firm. The ask? Elegant and understated ways to add branding details in a worldwide network of briefing centers. Each space needed its own unique solution but the overall project required consistency from center to center. Following design guidance from our agency partner, we created custom sculptural elements for the centers that nodded to the brand’s mark. 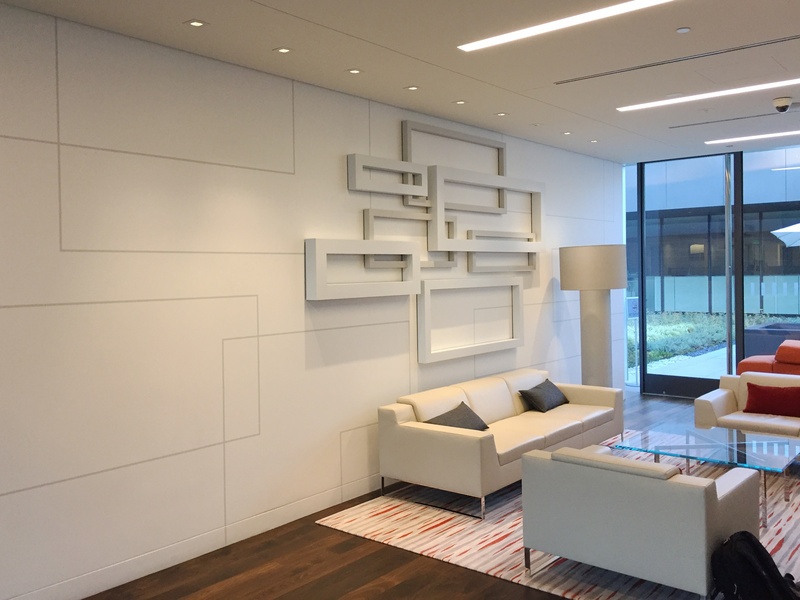 Where white walls lacked visual interest, we added subtle hand-painted wall stenciling in brand patterns. We worked with our agency partner from the start to ensure that design concepts would be feasible and work within their client’s budget. We conducted site audits to ensure that installation would go smoothly and be as undisruptive to the briefing center operations as possible. We provided production check-ins along the way to ensure that branding elements exceeded expectations. And, we delivered — our agency partner and their client couldn’t have been happier with the results.